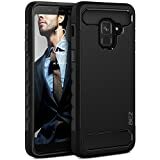 DESIGNED FOR THE SAMSUNG GALAXY A8 2018: This very well made Samsung Galaxy A8 2018 case is custom designed to fit the phone like a glove. Precision cutouts for camera, ports, and buttons keep everything readily accessible. You can charge your phone without removing it from the case and listen to earphones with the case closed. 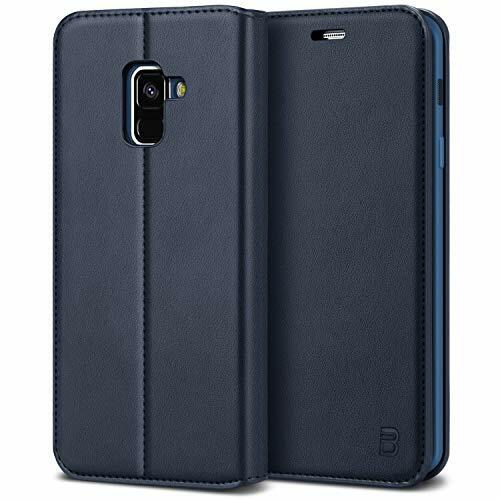 PREMIUM QUALITY AND STYLE: The Samsung Galaxy A8 2018 Leather Case combines a sleek slim fit design with quality that is built to last. 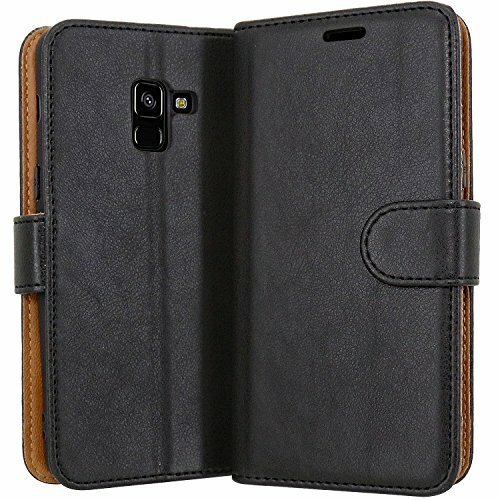 Made from premium synthetic leather with secure and straight stitching you will love how it feels in the hand or pocket and it will retain its appearance after lots of wear. 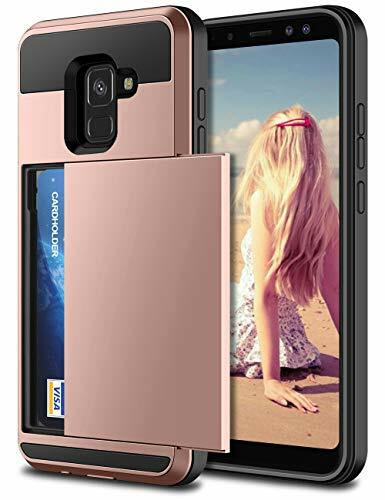 CARD SLOTS AND VIEWING STAND: The Samsung Galaxy A8 2018 cover is very functional and includes wallet-like features such as slots to hold cards. The multi-angle hands-free viewing stand allows your device to stand up independently in landscape orientation - great for video calls, or for viewing media. OFFERS GREAT PROTECTION TO THE PHONE: This Samsung Galaxy A8 2018 Wallet does a great job of protecting the phone. Get the benefit of a slim design with impact protection. This cover keeps the phone firmly secured in a snug fitting TPU holding bracket ensuring no risk of popping out if dropped. The flip design lets you use the screen without a screen protector and prevents screen breakages when closed. [Suitable Only]This Ultra-thin Silicone Case only suite for Samsung A8 2018. [Fabulous design] Clear transparent PC back case and TPU cushion cover not only flaunts the original design of the Samsung A8, but also highlights its design and line with ultra protection, it is perfect and elegant. [Easy Grip] The Silicon TPU edge and the hard back case of the PC are designed with maximum friction for Samsung A8, the ultra hybrid case giving you the maximum grip to hold your Samsung A8. [Maximum protection] Cover Samsung A8 2018 has premium TPU for maximum protection against scratches and bumps and a soft frame to absorb shocks.Anti-impact and high-rise design protect your body of Samsung A8. [Epic Precision] Extremely well designed for galaxy A8, all buttons are easily accessible with full cover protection. All Samsung A8 ports, sensors and plugs are available with extremely accurate, compatible cutouts for wireless charging. 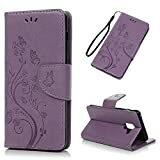 Compatible with:Samsung Galaxy A8 2018; Pretty butterfly embossed pu leather case will help you win in show time.Decent material and well made artwork enables snug touch, you will like how it feels in the hand or pocket.It will be a great gift for your friends or family.Kindly note it fits Samsung Galaxy A8 2018 ONLY, NOT for 2017 or 2016 or 2015. Wallet card slots and hidden pocket offer multi-functions;Wrist strap for carrying convenience; Magnetic clasp securely keeps all your valuables in place. Can act as a stand to support your phone,offers hands free when video chat or film watching. Precise cutouts for access to all ports, buttons, cameras, speakers, and mics.This Case fits Samsung A8 2018 like a glove without any harms to your phone's functions or application. Comprehensive all-around protection:premium soft TPU back holder bonded with high quality PU leather shell provides maximum protection to your phone. [SAFETY & SECURITY] Brand new case for Samsung Galaxy A8 2018 provides optimal protection from everyday bumps, knocks, drops, chips, dirt, scratches and marks without adding bulk to your phone and ensures that your device remains protected, safe and secured at all times. 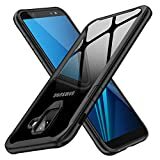 [COMPATIBILITY] Specifically designed for Samsung Galaxy A8 2018 model only. Full warranty with worry-free daily use of your smartphone. 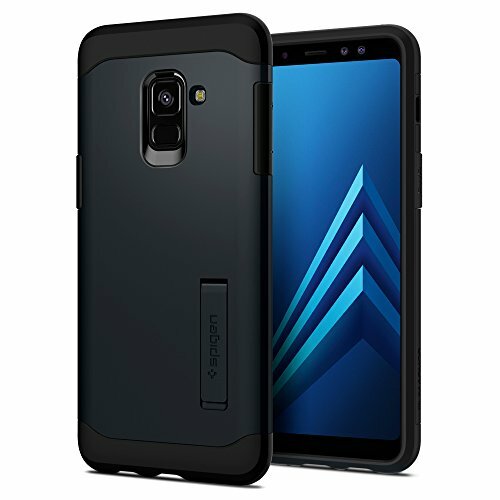 SAMSUNG GALAXY A8 2018 CASE: The New Desgin Shockproof Heavy Duty Tough Armor for Samsung Galaxy A8 2018. 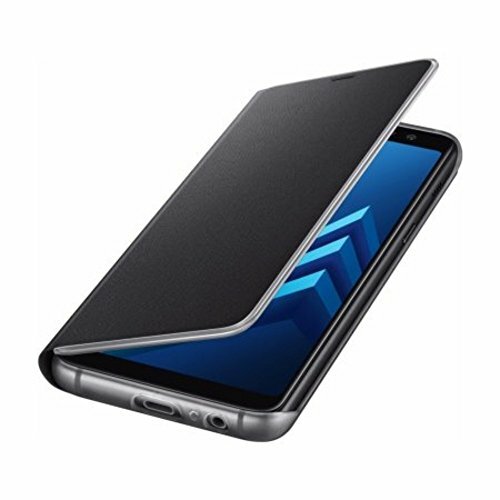 The Updated design compatible with the new Samsung Galaxy A8 2018. SOLID CONSTRUCTION: Double layer shockproof case design combines a protective hard shell and a shock absorbing TPU core. 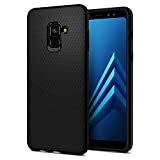 BEZ Samsung Galaxy A8 2018 Case only for Samsung Galaxy A8 2018. Please check your phone model before purchasing. 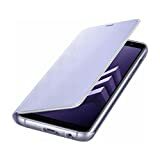 SLIM AND STRONG: Very sleek yet durable and protective. Ultra-Armor case for Samsung Galaxy A8 2018 provides the best protection level. PROTECTIVE LIPS: 1.5mm lip above the screen level to ensure your Samsung Galaxy A8 2018 screen is protected. 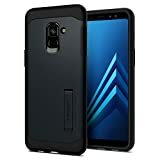 The back of the case also features bumper on corners that elevate the back of your Samsung Galaxy A8 2018 to prevent scratches to the back of your Samsung Galaxy A8 2018 case. EASE TO USE: Quick and easy access to ports and buttons. Innovative new button design ensures an extremely easy to press button experience for your Samsung Galaxy A8 2018. 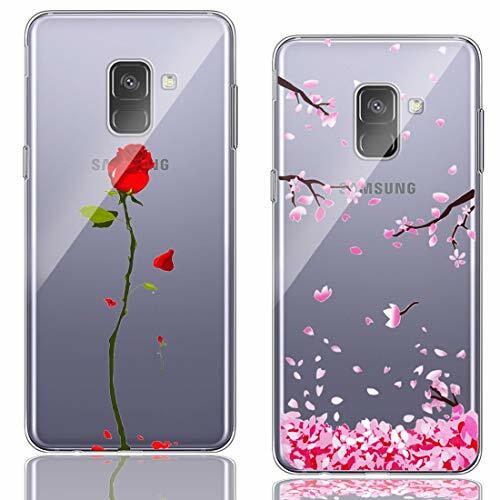 1.Designed for Samsung Galaxy A8 2018. 3. 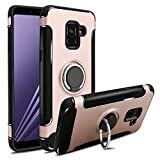 DUX DUCIS Samsung Galaxy A8 2018 Flip Folio Stand up Case Cover Holster surrounds all the edges, cover the whole phone with a full body protection on front and back when phone in your pocket and purse, well protected, more safe including the volume buttons and the mute switch, not just a bumper guard for the sides or back, really 360 protection. Compatibility: Designed exclusively for the Samsung Galaxy A8 (2018 Released). High Clarity: Anti-Yellowing material show of your phone's original style, micro dot pattern prevents the clinging "wet look," gives your phone a clean-looking, uniform fit. 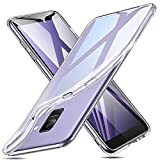 Perfectly fit for Samsung Galaxy A8 2018, Notice: It is NOT fit for Samsung Galaxy A8 Plus 2018. 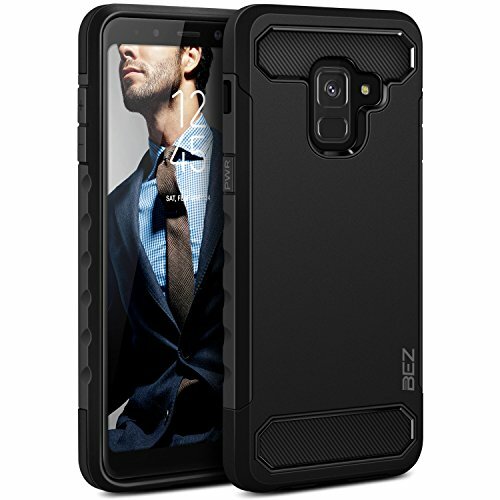 Hybrid Case: Combine a flexible, shock absorbing TPU layer cover and smooth defending PC hard Case to Protect and Enhance your Phone. Maximum Full Protection: Fully-covered edges and extra raised lips maximum protect your phone from drops, scratches and bumps. 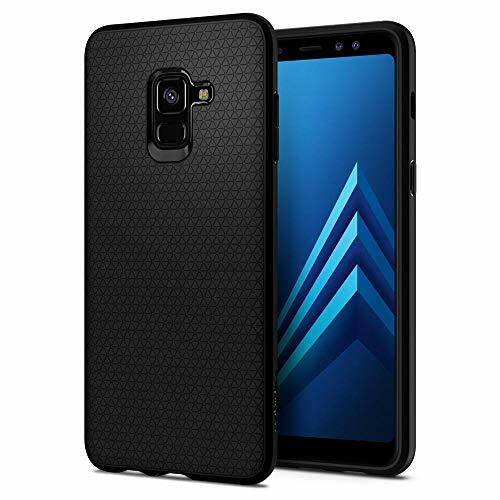 New specially designed sleek look featuring curved and alternating impact absorbing geometric pattern for added drop dispersing protection for the Samsung Galaxy A8 2018. Heavy duty defense and brushed metal texture layout with a mechanical design complete with Military Grade MIL-STD 810G - 516.6 drop protection. 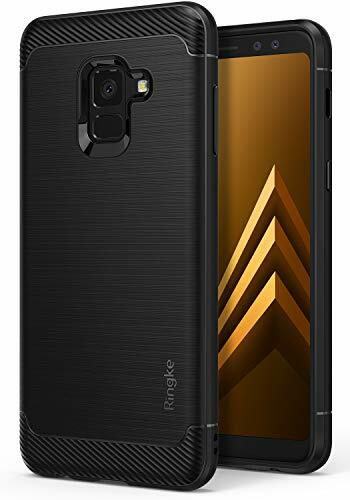 Precision-cut black silicone TPU profile improves the slim and streamlined appearance of the Samsung Galaxy A8 2018 with a tough outer flexible protective layer closely contouring each edge and curve of your device. The precise slim fit stays perfect and true to preserve all the premium profile of the Samsung Galaxy A8 2018. Highly durable specialized thermoplastic urethane material case is perfectly compatible and secures your device in a comfortable flexible fit for optimized protection against scratches or scrapes. Super thin and lightweight, there's no chance in weighing down or bulking up your slim device. Superior tactile grip for the ultimate ergonomic comfort handling the Samsung Galaxy A8 2018. Full degree protection covers all four corners and side edges on your new Samsung Galaxy A8 2018. A slim raised front lip also protects your screen from touching the flat surface and rear camera is protected with a back tapered lip. 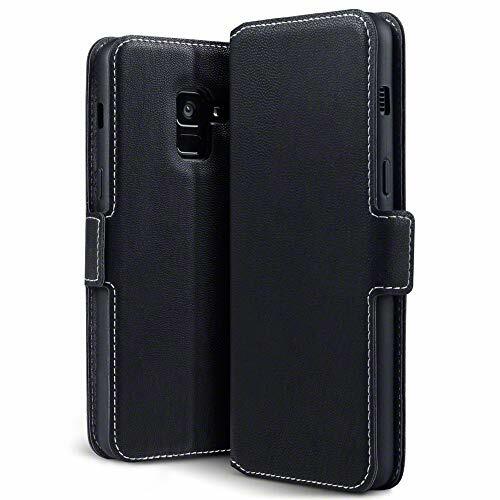 SAMSUNG A8 2018 CASE: High quality faux leather we use, soft and durable. 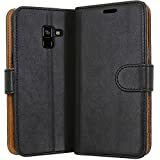 Premium look distressed leather designed to be the protection for your Samsung Galaxy A8 2018 against accidental moisture, collision, scratch. 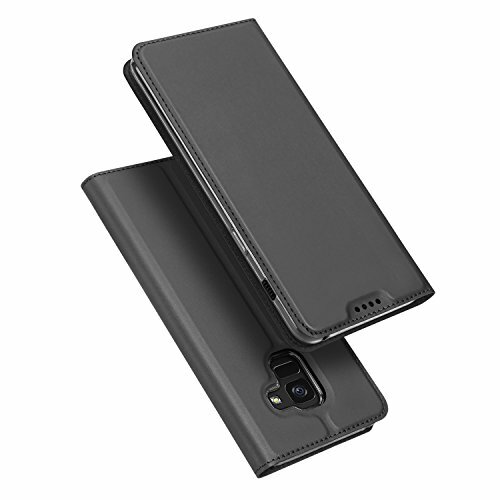 BETTER FUNCTION: The premium flip case is a slim and comfortable fit wallet for your Samsung Galaxy A8 2018 that allows you to function your phone easily. The kickstand function allows you to enjoy watching your favorite movie and doing the live chat. 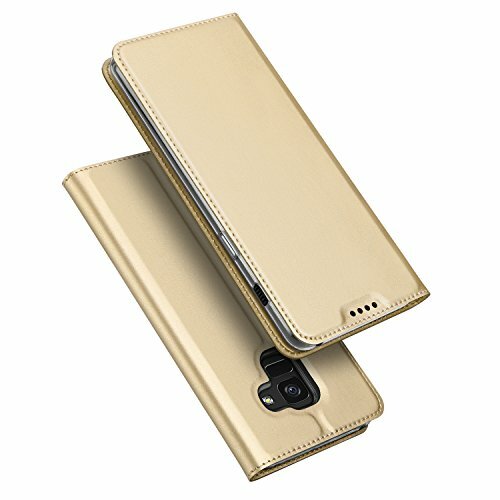 IMPORTANT NOTE: This wallet flip case cover is only compatible with "Samsung Galaxy A8 2018". Please check your phone model before purchasing. 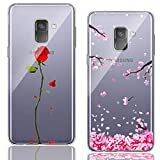 Designed for Samsung Galaxy A8 2018. 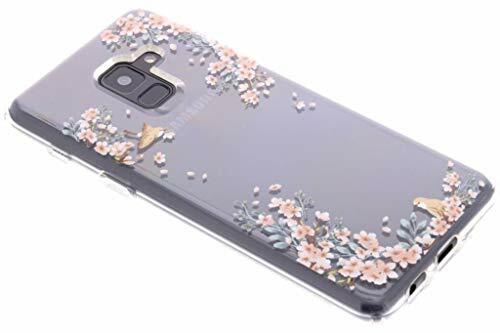 Beautiful Flower Pattern improve the aesthetic sensation of your Samsung A8 2018 case. Flower language, red roses convey deep emotions and can also be used to convey respect, admiration and devotion. Flower language, the blooming of Cherry Blossom represents spring, and a new start after a long cold winter. Resistant and Flexible TPU (Thermoplastic Polyurethane), made with high quality material, which avoids turning yellow quickly. Soft, Flexible and Ultra-Resistant cover, effectively protects your smartphone from bumps, scratches and dust.